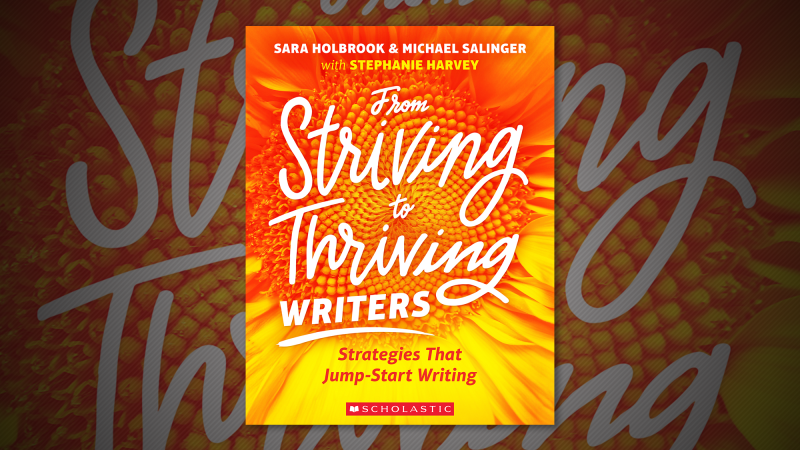 Sara Holbrook and Michael Salinger, with Stephanie Harvey, are co-authors of From Striving to Thriving Writers. All writing is creative. Any time we put something down on paper, whether that’s an email, work instructions, a contract, a poem, or a short story, we are making something that did not exist before. Informational and aesthetic writing are not as different as many have been led to believe. Both require a writer’s ability to organize their thoughts and a solid understanding of craft. Strengthening writing proficiency benefits students in ways critical to their long term personal and professional success, helping them to become both thinkers and communicators. Embed writing in all content areas: We need writing strategies that don’t displace inquiry or content area learning. In From Striving to Thriving Writers: Strategies That Jump-Start Writing, we provide teachers with simple frameworks to stimulate thinking and writing and show how they can be used across the curriculum. These frameworks naturally differentiate, providing every student with an opportunity for success. Pre-write to get it right: Our framework process encourages conversation and a strong pre-write, often incorporating a graphic organizer (a GO sheet) to help students organize their research and ideas before writing. Throughout, we maintain a consistent lesson process so that students will later be able to replicate it on their own. Take it one version at a time: We tell students to title each piece of writing as a version, starting with version 1. This frees up students to take risks and builds in the expectation that writing is an evolutionary process. With each subsequent version, we challenge the writers to incorporate additional details and writing elements, increasing the sophistication incrementally. Through writing, learners are able to prioritize, synthesize, and communicate ideas. If we incorporate writing as a priority across disciplines, writing becomes an artifact of students’ thinking, informing our instruction and providing quick assessments. Writing both builds and expresses understanding, connecting students with the greater world, and connecting us to our students.